Tuesday, August 7, 2018 at 6:15 p.m. The UK's tallest sculpture awaits. 455 steps up the ArcelorMittal Orbit and one of the best 360-degree views of the city followed by London's favourite - and the world's longest and tallest - tunnel slide, twisting and turning all the way down to Earth. Race against the clock to make it up to the top viewing platform and recover for a souvenir photo before taking the 40-second slide back to the bottom. Starting with your on-the-ground briefing, you'll be directed to the start line for your exclusive slot. 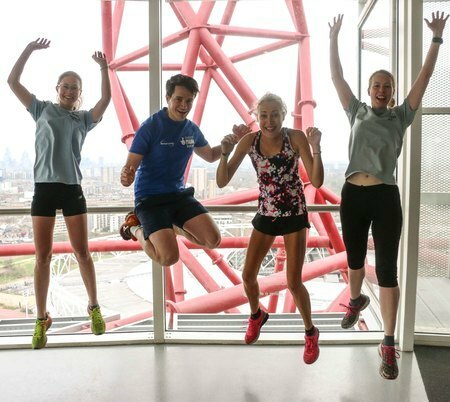 On the starter's gun you'll fly off one challenger at a time, into the 350m staircase chamber that skirts to the viewing platform at the top of London's iconic ArcelorMittal Orbit. Take a moment to enjoy the view, grab a drink and catch your breath before the hair-raising slide down. Participants must be aged 17 or over on the day of the event. Places are limited and must be booked in advance. Entry fees include an exclusive UpSlideDown head band, medal and goody bag for each challenger.